Numerous studies have been conducted to evaluate the addition of high-oil (greater than 10% crude fat) and reduced-oil (less than 10% crude fat) dried distillers grains with solubles (DDGS) sources at inclusion rates of up to 60% of the diet — using metabolizable energy (ME) or net energy (NE) formulation methods — for nursery and growing/finishing pigs. My team conducted a meta-analysis to summarize the overall growth performance responses of nursery and growing/finishing pigs using data from 26 peer-reviewed references and one thesis published from 2010 to 2017 (Asmus et al., 2014; Benz et al., 2011; Coble et al., 2017; Cromwell et al., 2011; Davis et al., 2015; Duttlinger et al., 2012; Graham et al., 2014a,b,c; Hardman, 2013; Jacela et al., 2011; Jha et al., 2013; Jones et al., 2010; Kerr et al., 2015; Lammers et al., 2015; Lee et al., 2013; Li et al., 2012; Mc- Donnell et al., 2011; Nemechek et al., 2015; Overholt et al., 2016; Pompeu et al., 2013; Salyer et al., 2013; Seabolt et al., 2010; Tsai et al., 2017; Wang et al., 2012; Wu et al., 2016; Ying et al., 2013). In practice, if accurate energy, digestible amino acid and phosphorus levels are used in diet formulation and are specific for the DDGS source being fed, there should be no change in growth performance at relatively high (30%) dietary inclusion rates compared with feeding corn/soybean meal diets without DDGS. Although there were fewer observations for growth performance responses of nursery pigs (n = 19) compared with growing/finishing pigs (n = 87), the proportion of responses showing reduced average daily gain (ADG) and gain:feed (26%) from feeding DDGS diets was similar for nursery pigs and growing/finishing pigs, with ADG at 32% versus 28%, respectively, and gain:feed at 26% for both (Table 1). However, the majority of all observations for nursery and growing/finishing pigs showed no change in ADG, average daily feed intake (ADFI) and gain:feed, at 71%, 63% and 67%, respectively. Therefore, if nursery and growing/ finishing diets are formulated using ac- curate energy and digestible amino acid values for the DDGS source being fed, the majority of studies show that feeding diets containing DDGS will provide growth performance responses similar to feeding corn/soybean meal diets the majority of the time. One of the common misconceptions among swine nutritionists is that reduced-oil (<10% crude fat) DDGS has less energy and a lower feeding value than traditional high-oil DDGS. While this is true for some DDGS sources, the crude fat content of DDGS is a poor single predictor of energy content among DDGS sources (see Part 2 of this series in the July 2 issue of Feedstuffs). However, if published energy and digestible amino acid prediction equations are used to dynamically estimate these important nutritional components in the DDGS source(s) being fed and appropriate formulation adjustments are made, there should not be a reduction in growth performance unless there is mycotoxin contamination. A summary of growth responses from feeding high-oil (>10%) and reduced-oil (<10%) DDGS sources is shown in Table 2. Overall, the majority of observations in these 27 studies showed an increase or no change in ADG between feeding high-oil (88%) or reduced-oil (64%) DDGS. For ADFI, 82% of the observations showed an increase or no change when feeding high-oil DDGS sources, compared with 68% of responses for reduced-oil DDGS. In contrast, 65% of observations showed an increase or no change in gain:feed from feeding high-oil DDGS versus 78% when feeding reduced-oil DDGS (Table 2). The majority of responses showing reduced ADG, ADFI or gain:feed were due to using inaccurate energy and digestible amino acid values for reduced- oil DDGS. Because of the increased use of high- fiber co-products (e.g., DDGS or wheat midds) in swine diets, many swine nutritionists have adopted the use of the NE system as a more accurate approach to evaluating feed ingredients and formulating swine diets for optimal caloric utilization efficiency compared with the ME system. Unfortunately, the NE content and prediction for DDGS sources are not as well defined as for ME content. Although the majority of studies (22 out of 27) in our meta-analysis used the ME system compared with the NE system (Table 3) to formulate diets with DDGS, the majority of observations showed similar responses (increase or no change) in ADG: 71% for ME, and 76% for NE. A greater proportion of observations showed an increase or no change in ADFI using the ME (75%) versus the NE (62%) system, and all of the gain:feed responses resulted in no change when using the NE system, compared with 67% of responses showing increases or no change when using the ME system. These results suggest that improved caloric efficiency can be achieved by using accurate NE values for DDGS sources, but more research is needed to develop and validate accurate NE prediction equations for DDGS. 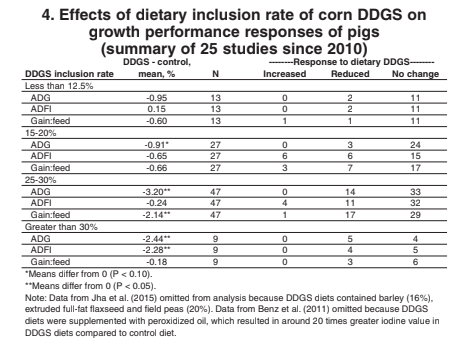 A summary of growth performance responses at various dietary DDGS inclusion rates is shown in Table 4. Negligible effects of feeding diets containing up to 20% DDGS on ADG, ADFI and gain:feed have been observed when feeding reduced-oil DDGS to nursery and growing/ finishing pigs. In fact, the majority of responses for ADG (70%), ADFI (68%) and gain:feed (62%) showed no change when feeding diets containing 25-30% DDGS. However, although the number of observations was limited (n = 9) when feeding diets containing more than 30% DDGS, about half showed no change in ADG and ADFI, while the other half showed about a 2.4- 2.8% reduction. However, the magnitude of these negative responses was small (e.g., ADG of 0.90 kg versus 0.92 kg per day between the DDGS and control diets). There are several explanations for why feeding swine diets with high inclusion rates (>30%) of DDGS may result in small decreases in the growth performance of pigs. First, DDGS has much greater fiber content than corn and soybean meal, with a neutral detergent fiber content of 35-45%. Fiber reduces the ME and NE content of swine diets and also can limit feed intake due to gut fill. As a result, pigs in the nursery and early grower stages may not be able to physically consume enough of a high-fiber diet to meet their energy requirements. Research to improve fiber utilization and the ME and NE content of DDGS diets by supplementing diets with feed enzymes has become one of the most widely researched topics in recent years. Unfortunately, the use of commercially available carbohydrates and proteases in DDGS diets has not provided consistent or substantial improvements in fiber digestibility and energy utilization by pigs. Second, use of accurate ME or NE values for DDGS in diet formulation is essential. Many nutritionists are unaware of the opportunity to use accurate prediction equations to estimate the variable energy (ME) content in DDGS (Urriola et al., 2014), which was covered in Part 2 of this series. Use of ME values derived from these equations will ensure optimal diet formulations to minimize suboptimal feed intake and growth. Furthermore, standardized ileal digestibility of amino acids are affected by the fiber concentration in DDGS (Urriola and Stein, 2010), which led us to conduct a meta-analysis of published data to provide accurate prediction equations for dynamically estimating the standardized ileal digestible (SID) amino acide values of corn DDGS sources based on total amino acid and neutral detergent fiber content (Zeng et al, 2017). In fact, some commercial companies (e.g., Nutriquest, Cargill and Evonik) offer services to nutritionists to estimate the NE and/or SID of amino acids for DDGS. Therefore, nutritionists should use these prediction equations or services to estimate the ME, NE and SID amino acid content among sources of corn DDGS. Other aspects of DDGS composition that may affect the growth performance of pigs when feeding high dietary inclusion rates (greater than 30%) to pigs have been studied less. Corn DDGS contains high concentrations of fiber, and high dietary fiber increases the threonine requirement of pigs (Zhu et al., 2005). Mathai et al. (2016) showed that the threonine requirement, expressed as a ratio to lysine, was increased for pigs consuming diets with soybean hulls and pea fiber compared with pigs consuming a low-fiber diet. Depending on fiber composition, endogenous losses of threonine — and the subsequent requirement of threonine – likely are increased when feeding diets containing high concentrations of DDGS (Blank et al., 2012). Based on data from Huang et al. (2017) and Saqui-Salces et al. (2017) and the National Research Council (2012) model, the estimated threonine endogenous loss (as a percentage of the requirement), from feeding a high-DDGS diet is 7.7%, compared to 3.2% when feeding a corn/soybean meal diet. As a result, the optimal SID threonine:lysine ratio in DDGS diets may be 61%, compared with 59% in corn/soybean meal diets. In addition to the role DDGS fiber plays in endogenous losses of threonine, DDGS also contains a 3.3 times greater concentration of leucine than soybean meal, and the high proportion of leucine relative to isoleucine (1.12x) and valine (1.47x) may result in a deficiency of isoleucine and valine when feeding pigs high-DDGS diets (>30%) with reduced soybean meal content. These three branched-chain amino ac- ids share the same degradation pathway through the alpha-keto-acid dehydrogenase complex (BCKDC). This enzyme is inactivated by a kinase, and its activity is modified by the product of catabolism of leucine (Harris et al., 2004). Consequently, excess intake of leucine increases the catabolism of isoleucine and valine (Wiltafsky et al., 2010; Gloaguen et al., 2012). Although Htoo et al. (2017) determined the isoleucine and valine requirements of pigs fed excess leucine (more than 160 of SID leucine:lysine), diets containing DDGS have different proportions of leucine to isoleucine and valine, and the validity of using these branched-chain amino acid ratios when formulating DDGS diets has not been evaluated in large commercial swine production systems. The effect of excess dietary leucine primarily results in a reduction in feed intake. Excess leucine content in DDGS — and subsequent catabolism of isoleucine and valine — can be mitigated by allowing crude protein from soybean meal to meet the amino acid requirement and avoiding the use of high amounts of synthetic lysine (less than 0.15% lysine hydrochloride) and other amino acids (Stein and Shurson, 2009). However, the current relatively low price of synthetic amino acids and DDGS supports reducing the use of soybean meal and increasing the use of synthetic amino acids in swine diets containing more than 30% DDGS. Furthermore, the effects of excess dietary leucine on the catabolism of isoleucine and valine may also be reduced by adding synthetic isoleucine to the diet to achieve an adequate amino acid balance. Studies are underway to evaluate the branched-chain amino acid balance in diets containing more than 30% DDGS for nursery and growing/finishing pigs. Blank, B., E. Schlecht and A. Susenbeth. 2012. Effect of dietary fibre on nitrogen retention and fibre associated threonine losses in growing pigs. Arch. Anim. Nutr. 66:86-101. Coble, K.F., J.M. DeRouchey, M.D. Tokach, S.S. Dritz, R.D. Goodband and J.C. Woodworth. 2017. Effects of distillers dried grains with solubles and added fat fed immediately before slaughter on growth performance and carcass characteristics of finishing pigs. J. Anim. Sci. 95:270-278. D.C. Mahan, P.S. Miller and M.C. Shannon. 2011. Corn distillers dried grains with solubles in diets for growing-finishing pigs: A cooperative study. J. Anim. Sci. 89:2801-2811. Gloaguen, M., N. Le Floc’h, E. Corrent, Y. Primot and J. van Milgen. 2012. Providing a diet deficient in valine but with excess leucine results in a rapid decrease in feed intake and modifies the postprandial plasma amino acid and alpha-keto acid concentrations in pigs. J. Anim. Sci. 90:3135-3142. Graham, A.B., R.D. Goodband, M.D. Tokach, S.S. Dritz, J.M. DeRouchey and S. Nitikanchana. 2014c. The interactive effects of high- fat, high-fiber diets and ractopamine HCl on finishing pig growth performance, carcass characteristics and carcass fat quality. J. Anim. Sci. 92:4585-4597. Hardman, S.J. 2013. Effect of dietary distillers dried grains with solubles (DDGS) and pig removal strategy at harvest on the growth performance, carcass characteristics and fat quality of growing-finishing pigs. M.S. thesis, University of Illinois at Urbana-Champaign. Harris, R.A., M. Joshi and N.H. Jeoung. 2004. Mechanisms responsible for regulation of branched-chain amino acid catabolism. Biochem. Biophys. Res. Commun. 313:391-396. Htoo, J.K., K. Manner and J. Zentek. 2017. Excess dietary leucine level increases the optimal dietary isoleucine-to-lysine ratio in 8- to 21-kilogram pigs. J. Anim. Sci. 95:195. Huang, Z., P.E. Urriola and G.C. Shurson. 2017. Use of in vitro DM digestibility and gas production to predict apparent total tract digestibility of total dietary fiber for growing pigs. J. Anim. Sci. 95:5474-5484. Jacela, J.Y., J.M. DeRouchey, S.S. Dritz, M.D. Tokach, R.D. Goodband, J.L. Nelssen, R.C. Sulabo, R.C. Thaler, L. Brandts, D.E. Little and K.J. Prusa. 2011. Amino acid digestibility and energy content of deoiled (solvent-extracted) corn distillers dried grains with solubles for swine and effects on growth performance and carcass characteristics. J. Anim. Sci. 89:1817- 1829. Jones, C.K., J.R. Bergstrom, M.D. Tokach, J.M. DeRouchey, R.D. Goodband, J.L. Nelssen and S.S. Dritz. 2010. Efficacy of commercial enzymes in diets containing various concentrations and sources of dried distillers grains with solubles for nursery pigs. J. Anim. Sci. 88:2084-2091. Lammers, P.J., B.J. Kerr and M.S. Honeyman. 2015. Biofuel co-products as swine feed ingredients: Combining corn distillers dried grains with solubles (DDGS) and crude glycerin. Anim. Feed Sci. Technol. 201:110-114. Li, G., Z. Wang, M. Lin, Z. Lu and W. Yao. 2012. Effects of corn DDGS in combination with compound enzymes on growth performance, carcass fat quality, plasma and tissue redox homeostasis of growing-finishing pigs. Livest. Sci. 149:46-52. Mathai, J.K., J.K. Htoo, J.E. Thomson, K.J. Touchette and H.H. Stein. 2016. Effects of dietary fiber on the ideal standardized ileal digestible threonine:lysine ratio for twenty-five to fifty kilogram growing gilts. J. Anim. Sci. 94:4217-4230. Nemechek, J.E., M.D. Tokach, S.S. Dritz, R.D. Goodband, J.M. DeRouchey and J.C. Woodworth. 2015. Effects of diet form and type on growth performance, carcass yield, and iodine value of finishing pigs. J. Anim. Sci. 93:4486-4499. Overholt, M.F., J.E. Lowell, E.K. Arkfeld, I.M. Grossman, H.H. Stein, A.C. Dilger and D.D. Boler. 2016. Effects of pelleting diets without or with distillers’ dried grains with solubles on growth performance, carcass characteristics and gastrointestinal weights of growing-finishing barrows and gilts. J. Anim. Sci. 94:2172- 2183. Salver, J.A., M.D. Tokach, J.M. DeRouchey, S.S. Dritz, R.D. Goodband and J.L. Nelssen. 2013. Effects of standardized ileal digestible tryptophan:lysine in diets containing 30% dried distillers grains with solubles on finishing pig performance and carcass traits. J. Anim. Sci. 91:3244-3252. Saqui-Salces, M., Z. Luo, P.E. Urriola, G.C. Shurson and B.J. Kerr. 2017. Effect of dietary fiber and diet particle size on nutrient digestibility and gastrointestinal secretory function in growing pigs. J. Anim. Sci. 95:2640-2648. Seabold, B.S., E. van Heughten, S.W. Kim, K.D. Ange-van Heugten and E. Roura. 2010. Feed preference and performance of nursery pigs fed diets containing various inclusion amounts and qualities of distillers coproducts and flavor. J. Anim. Sci. 88:3725-3738. Tsai, T., C.R. Dove, P.M. Cline, A. Owusu-Asiedu, M.C. Walsh and M. Azain. 2017. The effect of adding xylanase or b-glucanase to diets with corn distillers dried grains with solubles (CDDGS) on growth performance and nutrient digestibility in nursery pigs. Livest. Sci. 197:46-52. Urriola, P.E., and H.H. Stein. 2010. Effects of distillers dried grains with solubles on amino acid, energy and fiber digestibility and on hindgut fermentation of dietary fiber in a corn-soybean meal diet fed to growing pigs. J. Anim. Sci. 88:1454-1462. Wiltafsky, M.K., M.W. Pfaffl and F.X. Roth. 2010. The effects of branched-chain amino acid interactions on growth performance, blood metabolites, enzyme kinetics and transcriptomics in weaned pigs. Br. J. Nutr. 103:964-976. Wu, F., L.J. Johnston, P.E. Urriola, A.M. Hilbrands and G.C. Shurson. 2016. Evaluation of ME predictions and the impact of feeding maize distillers dried grains with solubles with variable oil content on growth performance, carcass composition and pork fat quality of growing-finishing pigs. Anim. Feed Sci. Technol. 213:128-141. Zhu, C.L., M. Rademacher and C.F.M. De Lange. 2005. Increasing dietary pectin level reduces utilization of digestible threonine intake, but not lysine intake, for body protein deposition in growing pigs. J. Anim. Sci. 83:1044-1053.